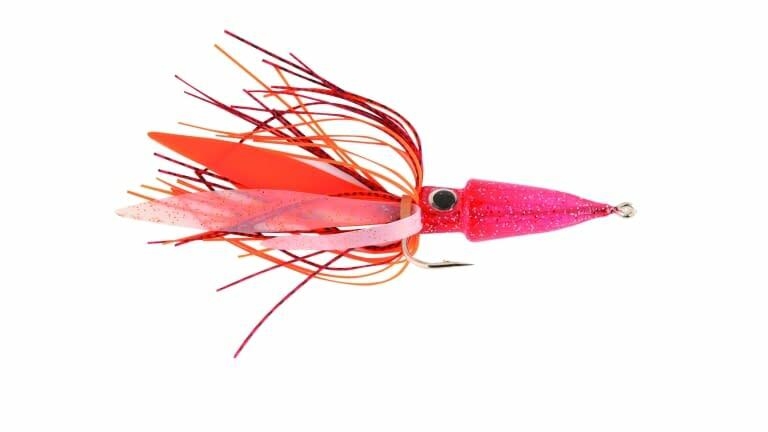 The Conehead Squid is the newest addition to our saltwater lineup of bottom fishing products. This lure comes rigged on a 5 foot leader tied with 60 pound P-Line Leader Material. To the bottom of the leader you can attach your favorite jig such as a Diamond Bar, Laser Minnow, or Hali-Drop Jig. Thirty inches above the jig the Conehead squid is rigged on a loop knot which allows for maximum action. The Conehead itself is made of a sparkled acrylic, with oversized eyes, and 3 different types of tentacles. You're now able to fish two different profiles of baits, increasing your chance at success.